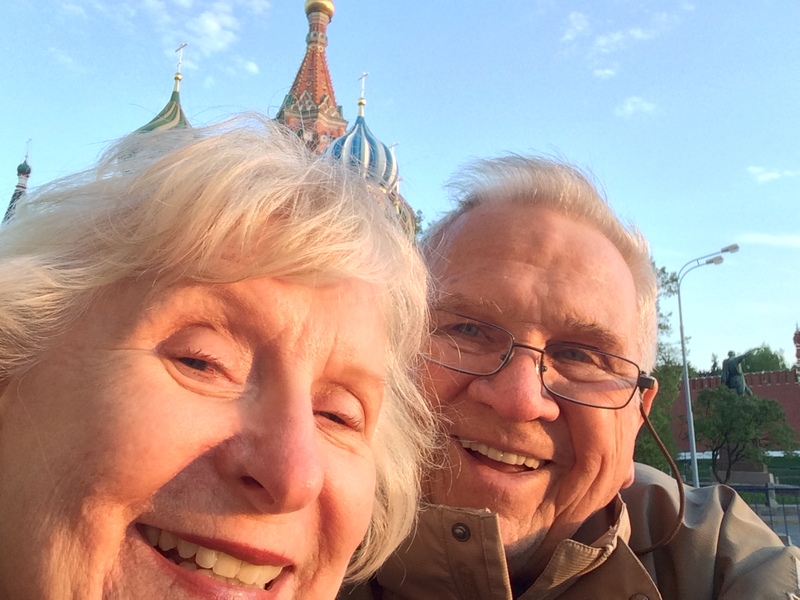 Mom and Dad got a full night’s sleep on the 11-hour flight so they were “like cucumbers,” as they say in Russian. Fresh and ready to go. Moscow’s modern international terminal is such an improvement over the 80’s-era monstrosity of the past. 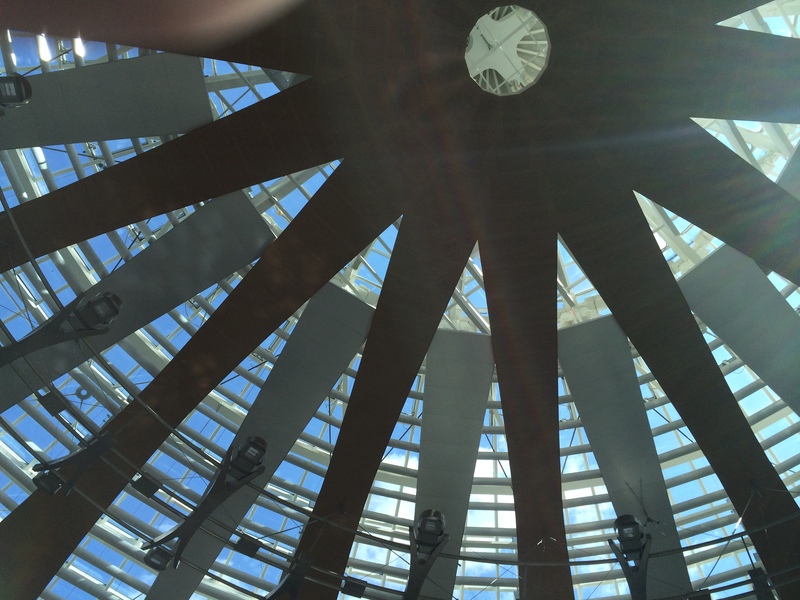 Mom snapped a quick photo of the skylight above the passport control area. She was quickly scolded. That’s how you know you’ve finally arrived, once the scolding begins. I could write a whole blog post just about scolding, but the gist of it is that you can’t spend any time in this country at all without enduring at least a little scolding. Russians, I believe, endure so much scolding from their fellow countrymen that it doesn’t faze them one bit. 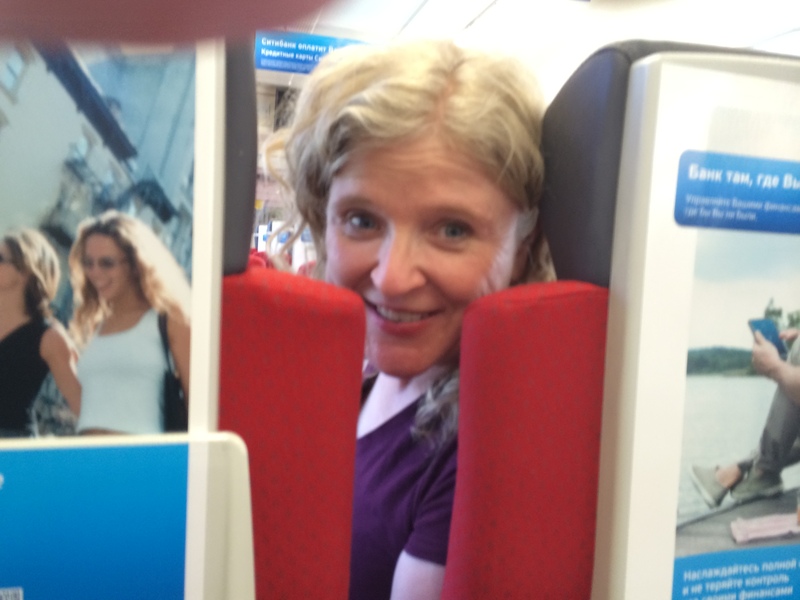 I had arranged for a private guide to meet us at the airport to help us get to our rented apartment in the city center. His name is Daniel Petrov and was a huge help in getting us and all of our luggage onto the light rail. Thank god for Daniel! Not to be outdone by Mom, Dad started snapping pics, too. This one on the light rail. The light rail let us off right next to our apartment. But even though the apartment was right there, actually getting to the apartment was a logistical puzzle, given the huge intersection, the train station, and the seemingly never-ending construction project at Belorusskij Vokzal. Seriously, they’ve been building there for at least 5 years, at least. Enough already! Anyway, Daniel navigated us and our luggage under bridges and over ditches, across wooden walkways and mud puddles, finally depositing us in our apartment. 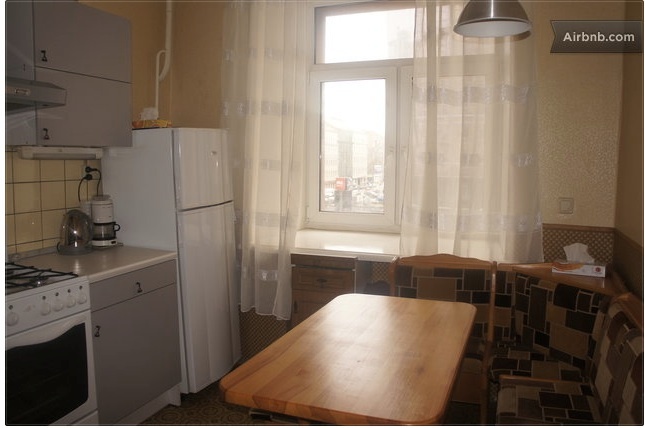 In searching for apartments to rent in Moscow I wanted one that was affordable and central. Thus, our options were limited, to say the least. But through Airbnb we got a two-room apartment right on Moscow’s central thoroughfare. Seeking to tap into the demand for retro-chic, the apartment was appropriately named, “Greetings from Communism.” In other words, a dwelling that looked like it walked in right out of 1985. Here’s the kitchen where, just like Russians, we spent most of our time. We walked around downtown and got a bit peckish, so Daniel took us inside GUM for a light snack. 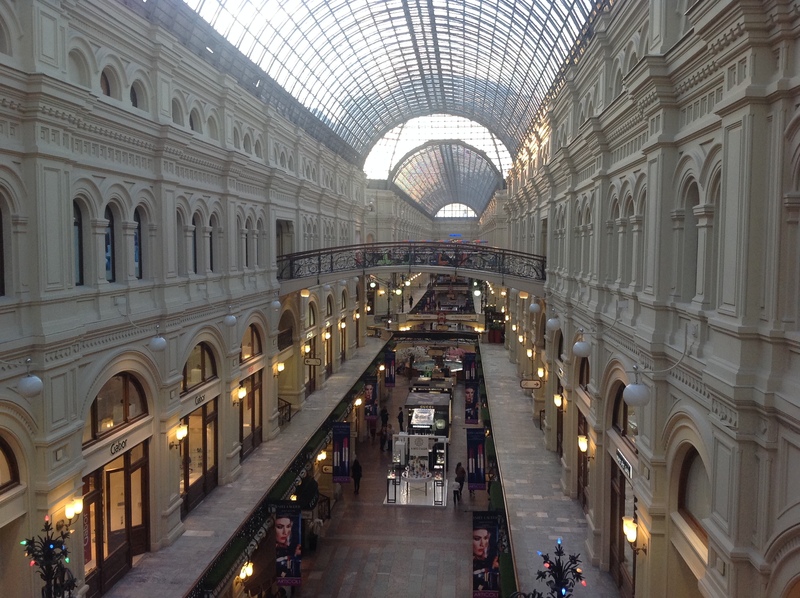 GUM is many things: it is an architectural wonder, a former representative example of the Soviet state store, and a current nexus for anything ultra-chic and ultra-expensive. Built at the end of the 19th century, the steel and glass roof weighs over 200 thousand pounds and is strong enough to even support significant snow accumulation. 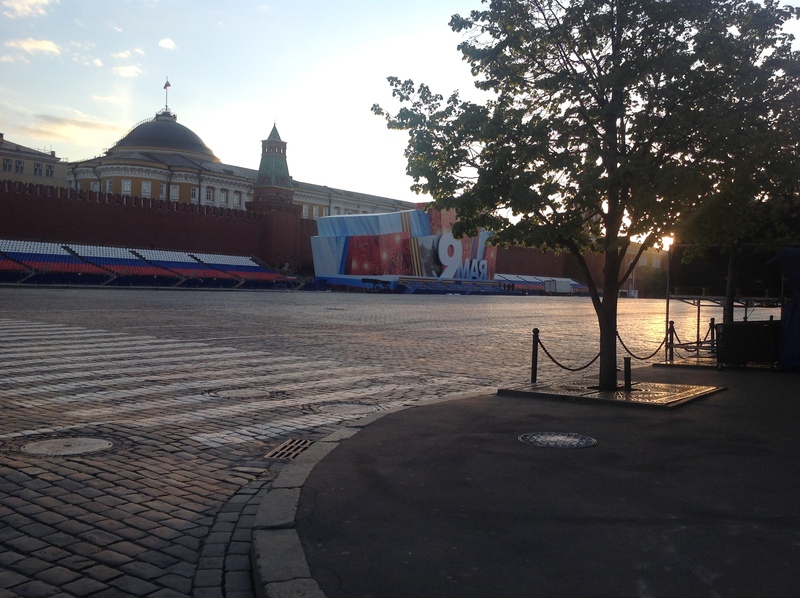 It runs along the eastern edge of Red Square. During Soviet times, the acronym GUM stood for Government Universal Store; now the acronym means Main Universal Store. 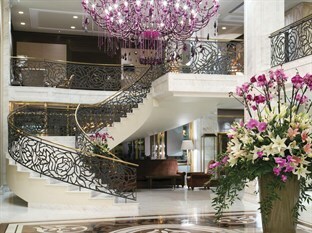 It is essentially the equivalent of Rodeo Drive in Beverly Hills all under one gigantic, skylighted roof. Despite its fanciness, GUM is now also home to a few affordable fast-casual eateries. 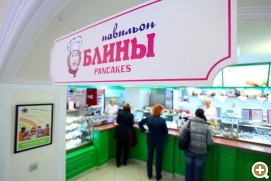 We stepped into one devoted to blinchiki: filled crepes. We opted for the ham and cheese ones. 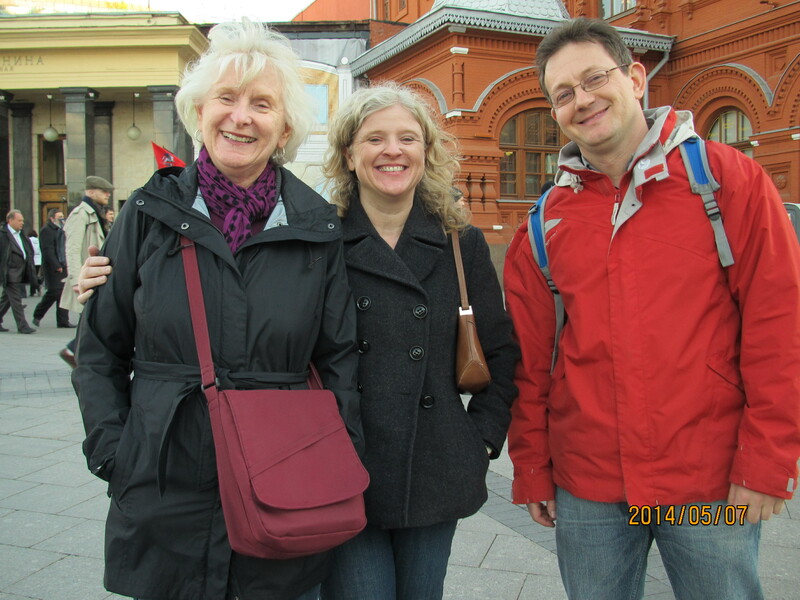 With the daylight waning, we strolled along the edge of Red Square. 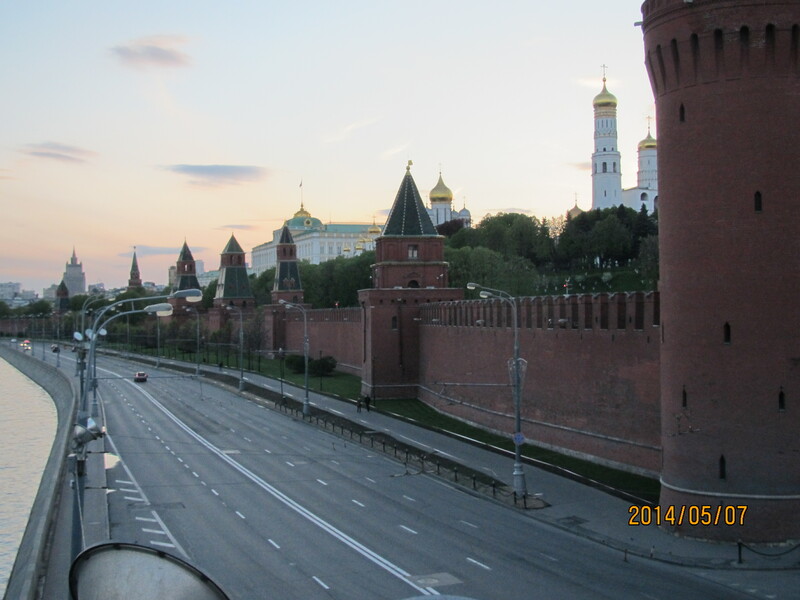 The square itself was closed off in preparation for the upcoming Victory Day celebrations. But, wow, look how beautiful the light was. We said our goodbyes to Daniel and took the metro back to our apartment’s neighborhood. We all felt like a drink would be nice. It was at this point that I realized how difficult it actually was being in charge. I knew we needed to get away from the train station, because it’s kind of a seedy area, but what do I know about downtown Moscow these days? Squat, that’s what. So I took my parents on what seemed like an interminable quest through the financial district for a simple drink. We wound up at this place that couldn’t quite settle on a theme. It was definitely a beer hall, with the dark wood interior of a Czech watering hole, but it was also, oddly, a hookah bar. We walked in and were immediately slapped with the smell of several different kinds of flavored tobacco. A waitress brought menus and I attempted to render aid to my non-Russian-speaking parents. I thought it might be easiest if I asked them what they wanted and then tried to find it for them on the menu. But, as is so often the case, they didn’t really know what they wanted. Hell, I didn’t know what I wanted, either, so I just opted for beer. Mom wanted something to nibble on, so we took a chance and ordered a menu item called simply, “beer snack.” Somehow we figured out that Dad wanted cheese balls and wine and we were on our way. I hadn’t really anticipated the many roles I would play here because I not only had to remember what everyone wanted, so I could tell the waitress, I also had to make some split-second decisions when those items were unavailable . However we managed to work it out, I soon had a cold beer in front of me which made everything better. The “beer snack” turned out to be a sort of pig-in-a-blanket situation and the cheese balls were quite tasty. Everyone was happy. In fact, a young man sitting behind us was so happy that he popped over to see if he could join us. He asked my parents if they would mind him practicing his English with them. My parents are nothing if not good sports, so they said, “Sure! Go for it.” But somehow, when faced with the actual task of speaking English, our young man simply spoke to me in Russian, which I then translated for my parents. 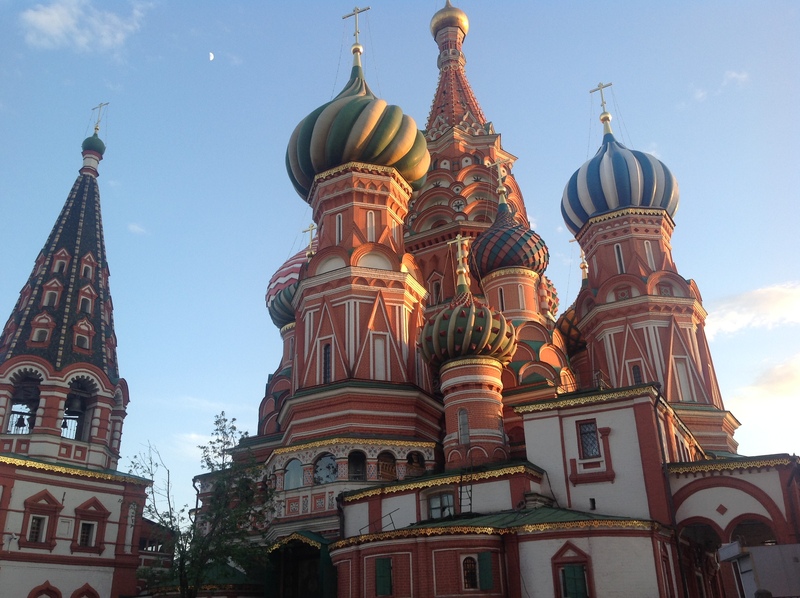 He kept asking my parents what their favorite part of Moscow was, which my parents, patiently, repeatedly, explained was impossible to answer because they had just arrived. In the end I think my parents just gave in and said their favorite thing was Red Square. Then he began to ask about Ukraine, and my Mom said she thought we should keep our nose out of it. Then he asked her if she was just saying that because she was afraid and Mom explained that she’s only afraid of two things: heights and snakes. The young man liked this answer very much. Our beer snack consumed and our eyes drooping with jet-lag, we tried to politely extract ourselves from conversation with the young man, who thanked us heartily for letting him practice his English (of which he had spoken nary a word). Back in the chilly night, the apartment turned out to be just around the corner. Thankful for the convenience, we all collapsed into sleepy exhaustion. Once I saw the beautiful skylight at the Moscow airport, I knew we were going to see some really beautiful things in Russia. Daniel provided us the guiding hand we needed after such a long trip, and the visit to the hookah bar was just another part of our adventure! Unexpected, but just one of those things.